Blake H was a 26 week 21 oz. micro preemie and a twin. Has a trach and feeding tube. Wears glasses or at at least he is supposed to. Ha! 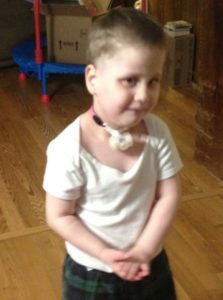 He has CP, sleep apnea , BPD, & Seizures. He is on the level of a 2 yr. old but dies not speak. He likes anything that plays music. Gift certificates from Kroger, Publix, Wal Mart. Sam’s or any grocery or clothing stores.